The Macy's Thanksgiving Day Parade "is an annual parade presented by the U.S. chain store business Macy's. 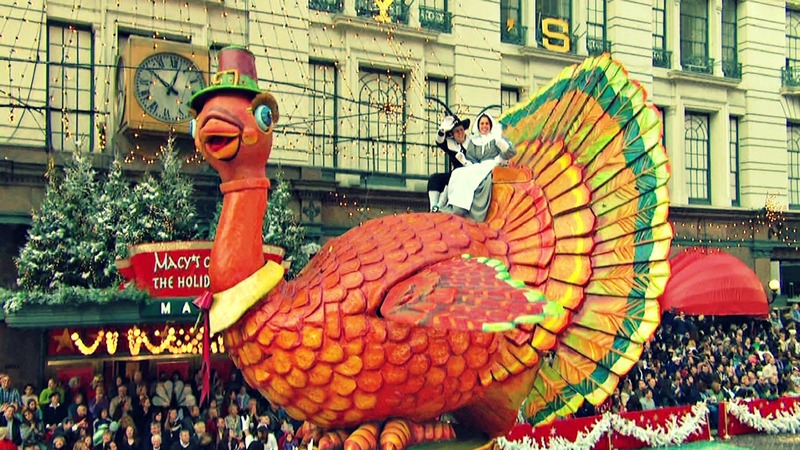 The tradition started in 1924, tying it for the second-oldest Thanksgiving parade in the United States along with America's Thanksgiving Parade in Detroit, with both parades four years younger than the 6abc Dunkin' Donuts Thanksgiving Day Parade in Philadelphia. The three-hour Macy's event is held in New York City starting at 9:00 a.m. EST on Thanksgiving Day, and has been televised nationally on NBC since 1952. The Macy's Thanksgiving Day Parade is watched by more than 3.5 million people on the parade route while another 50 million people watch the event live on television." Macy's, "originally R. H. Macy & Co., is a mid-range to upscale chain of department stores owned by American multinational corporation Macy's, Inc. It is one of two divisions owned by the company, with the other being the upscaleBloomingdale's. New York City. It also has eSpot ZoomShops kiosks in over 300 store locations sellingconsumer electronics." through the streets of NYC during the Thanksgiving Day Parade." "New Yorkers and visitors line the streets of Manhattan to catch a glimpse of the giant balloons and floats of Macy's 85th Thanksgiving Day parade... The show included 11 marching bands, 800 clowns, 1,600 cheerleaders, dancers and singers, crews manning 27 floats and handlers for 15 giant balloons and 44 other mid-sized balloons." "Hundreds of extras and (what looked to be authentic) props lined Central Park West between 60th and 63rd for a scene that seemed to take place at the Macy’s Thanksgiving Day Parade..."